If you were present for our Sunday service you most likely heard me say that this evening's lecture would be an in-depth look into the New American Standard version of the Bible. I feel that tonight's topic will tie in perfectly with what we've already covered so far, especially when dealing with the topic of 'many antichrists.' By way of review, we've already learned that the three main Biblical characteristics that causes Yahweh to define someone as antichrist are #1) They will deny that Jesus is the Christ (or 'Messiah'), #2) They deny Jesus as Lord and #3) They confess that Jesus hasn't come in the flesh. If we are able to better understand that one of Satan's tactics is to attack both the living and written Word of Yahweh than as Christians we should be better able to "put on the whole armour of God" and "stand against the wiles of the devil (Ephesians 6:11)." In this sermon, I intend to prove that not every book with the word 'Bible' in the title is the inspired Word of Yahweh and that even Lucifer himself has his own twisted translations or 'modern renderings' that his children seem to use every opportunity to push on the Christian people. As of late, I've seen an increased interest in the NASB come into the midst of the Christian movement. The aspect of following Christ, accepting Him as Savior and being saved by grace (Ephesians 2:8) is what separates us from all the other world religions out there that openly teach salvation is acquired by man's own works. Therefore, any attack on Jesus Christ or His deity should at minimum be questioned by sincere Christians and we should choose for ourselves the transliteration or translation of Yahweh's Word that most glorifies Him as Lord over all. Satan and his followers have two ways of 'supplanting' Yahweh's Word -- adding to or taking away from it. This is expressly forbidden in Revelation 22:18-19 which reads "If any man shall add unto these things, God shall add unto him the plagues that are written in this book: And if any man shall take away from the words of the book of this prophecy, God shall take away his part out of the book of life, and out of the holy city, and from the things which are written in this book." We've already covered that Jesus Christ was the living Word in Jesus, Yahweh Or Not? and we also covered the fact that when Satan tried to tempt Him he 'took away' from various scriptures. I think it's safe to say that Satan knows the Word of Yahweh better than we do and also knows how to manipulate it for his own reasons. This is shamefully apparent by many modern-day judeo-Christian congregations that never seem to get around to teaching God's Word or maybe cover one verse a week and then talk money for the remaining fifty minutes -- at that rate, it takes 598 years to read through the entire Bible! It would be painfully apparent if Satan added to Yahweh's word so his method of choice has always been removal of choice sections or key statements found in scripture. Likewise, in many contemporary versions of the Bible there are huge sections of scriptures removed or split in two and then spread out to fill in the verse numbers. Even more subtle is the removal of titles that prove the Fatherhood of Jesus to mankind. For example, in the NAS version the word 'Lord' is removed over twelve times and 'Christ' is deleted over sixteen times. At first glance, these differences may seem very minor to the average Christian but over repeat readings these small discrepancies add to even bigger deletions found elsewhere and further push the agenda of the so-called translators. Satan's biggest trick from the beginning was to take away from the Word of Yahweh when he asked "Yea, hath God said?" Jesus himself taught "Satan cometh immediately, and taketh away the word (Mark 4:15)" and "then cometh the devil, and taketh away the word (Luke 8:12)." Obviously, the one to profit from removing almost 6,400 words (10%) from the newer translations is the deceiver himself -- we'll expand on his attacks and twisted doctrine in a few minutes. In its defense, I should state that the 1611 King James Version of the Bible, also known as the only "Authorized" version, has stemmed every denomination of Christian at large today while at the same time almost every denomination branches or supports their own translations. The NAS supports the 'universalism' message being stemmed from the seldom-seen 1901 edition of the American Standard Version, itself a faulty translation. We'll look deeper into the background of the New American Standard a little later in this evening's message, right now I'd like to talk about Dr. S. Franklin Logsdon, co-founder of the NASB. Dr. S. Franklin Logsdon was one of the earliest supporters of The Lockman Foundation headed by businessman F. Dewey Lockman. It's from this corporation that we get the New American Standard Bible, complete with a preface penned by Dr. Logsdon himself. In course of time, after major errors began to surface in the NASB dealing with the deity of Jesus, Logsdon repented to god for his involvement in the deception having been the man who counseled Mr. Lockman about buying the copyright to the 1901 edition of the American Standard. I don't have the time to expand into Dr. Logsdon's involvement in The Lockman Foundation's business venture this evening. For those who are interested in a deeper study of the NASB, I can make available to you a radio sermon preached by Dr. S. Franklin Logsdon himself where he says "I must under God renounce all attachment to the NASB and the King James Version is 100% correct." This 45 minute message is available on CD or tape by request from Covenant People's Ministry and our internet readers can request the MP3 by e-mail. I make this message freely available to all who ask. Not so strange is the fact that The Lockman Foundation today denies any knowledge of S. Franklin Logsdon but a serious student can easily track down enough information to make the necessary ties and see the real story behind the deception. Logsdon pastored Moody Memorial Church of Chicago from 1950 to 1952 so why would a man destined to profit from an exclusively-copyrighted book turn around and renounce all dealings with it if not for the stirring of the Holy Spirit? Speaking of copyrights, another aspect that separates the Authorized KJV is its lack of one. Indeed, many King James Versions of the Bible bear a copyright but these are usually registered for the author's own commentaries, chain-references or study notes. If your KJV bears a copyright but appears to be 'plain vanilla' its authenticity should be questioned. One merely needs to remove or add an italicized word to retain a profitable copyright on the KJV but it's still altered text. Like Zondervan's own homosexual-biased NIV, the NASB has a strict copyright on its text and this is the very reason that it's not "freely given or freely received (Matthew 10:8)" in online Bible programs or even seminary colleges without paying a hefty royalty fee to The Lockman Foundation for its use. The very fact that they are profiting on Yahweh's Word should begin to raise some eyebrows. I'd like to show you an example of how Satan works through these 'new age bibles' by his age-old trick of deletion. Turn with me quickly to John 7:6-10 and I'll read you some text from the NASB: "So Jesus said to them, My time is not yet here, but your time is always opportune. The world cannot hate you, but it hates Me because I testify of it, that its deeds are evil. Go up to the feast yourselves; I do not go up to this feast because My time has not yet fully come. Having said these things to them, He stayed in Galilee. But when His brothers had gone up to the feast, then He Himself also went up, not publicly, but as if, in secret." Does anything seem out of place here? For one, Jesus supposedly lied about going to the feast. Can Jesus lie? Now from the King James Version, it reads -- "Then Jesus said unto them, My time is not yet come: but your time is alway ready. The world cannot hate you; but me it hateth, because I testify of it, that the works thereof are evil. Go ye up unto this feast: I go not up yet unto this feast; for my time is not yet full come. When he had said these words unto them, he abode still in Galilee. But when his brethren were gone up, then went he also up unto the feast, not openly, but as it were in secret." Notice the Satanic tactic? By dropping the one word "yet" the NASB gives the false illusion that Jesus was lying when he stated the reason for not going to the mentioned feast. Still, there's plenty of worse infractions like this doctrinal twist found in 2 Samuel 14:14 that reads in the Authorized Version: "For we must needs die, and are as water spilt on the ground, which cannot be gathered up again; neither doth God respect any person: yet doth he devise means, that his banished be not expelled from him." Most Christians are familiar with this verse about God not being a "respecter of persons." Now here's how that same verse is rendered in the faulty NASB, "For we will surely die and are like water spilled on the ground which cannot be gathered up again. Yet God does not take away life, but plans ways so that the banished one will not be cast out from him." Not only is that a doctrinal twist but it's an outright lie. A mere two chapters before this passage we read of a child born to the adulterous David and Bathseba in which "the LORD struck the child that Uriah's wife bare unto David, and it was very sick and on the seventh day the child died." Furthermore, in Deuteronomy 32:39 Yahweh Himself says: "I kill, and I make alive; I wound, and I heal: neither is there any that can deliver out of my hand" and 1 Samuel 2:6 tells us: "The LORD killeth, and maketh alive: he bringeth down to the grave, and bringeth up." Remember this one? "And the anger of the LORD was kindled against Uzzah. God smote him there for his error: and there he died by the ark of God (2 Samuel 6:7)." Without a doubt Yahweh takes away life, the NASB lies. In 1 Corinthians 8:4 we read that "we know that an idol is nothing in the world" yet the NASB teaches: "there is no such thing as an idol in the world." If you can't see the huge lie there I most likely can't help you with this particular sermon. Here's another twist that Lucifer might not want you to catch -- in 1 John 5:19 the King James Version states "And we know that we are of God, and the whole world lieth in wickedness." Do you want to hear that same verse in the NASB? Here it is: "We know that we are of God, and that the whole world lies in the power of the evil one." Satan could only wish that the 'whole world' laid in his personal power seat but fortunately for Christians it doesn't. Satan is known as the spiritual "prince of this world", as almost every other translation (NIV included) correctly states, but there are also other spiritual "princes" or beings working among the nations, and all of them are under the control of God, not Satan. Another false doctrine brought to you directly from the pages of the NASB! This might also explain why in Ephesians 6:16 the NASB changed "fiery darts of the wicked" to "flaming missiles of the wicked one." Yes, 'one' is added taking away from the generalist "wicked' making it into a personal deity, Satan. Also, notice the difference between 'dart' and 'missile?' Who benefits from this mental image of power? At this point in tonight's lecture I'd like to address the aspect of Bible study itself. In the 2nd epistle of Paul to Titus we read "Study to shew thyself approved unto God, a workman that needeth not to be ashamed, rightly dividing the word of truth (verse 15)." Does this statement say that we should 'make Yahweh's Word easier to read' or that we should study to learn His Word? Right, we're supposed to learn and study His Word only, bringing ourselves up to its higher level, not the other way around. We've already covered the book of Revelation in which Jesus Himself says that no man is to "add to or take away" from His Word. Would you say that dropping a 'yet' or 'adding a satanic deity' falls into this particular category or not? Most modern-day Bible supporters complain that the King's English is much too hard for them to understand. Still, for almost 395 years nobody has had these so-called 'problems' in understanding the King James Version of the Bible and it was the standard by which Christians taught the English language. However, in the past hundred years, since the influx of these 'easier to read' Bibles, people are now having problems understanding their own language. Doesn't that make you wonder? Personally, I study the King James Version and numerous additional translations, almost all of which pre-date the Authorized edition. I also suggest obtaining copies of the Septuagint, a Strong's Exhaustive Concordance and an Amplified King James Version (a parallel edition with a standard King James for reference, if possible). Be prepared to pay a few extra dollars for that Amplified Bible because it's also published by The Lockman Foundation, but it's still a much better investment than the fraudulent New American Standard Bible. You'll be hard-pressed to find a concordance for the NASB, much less any of the newer translations, so limiting yourself to a biased translation isn't a wise decision overall. Not that I'm for public school but could you imagine what would happen if each student had six different math books all teaching different answers? It would be total Babylonian confusion. That's also what's happening with Christianity today as we distance ourselves from Yahweh's perfect Word and turn to 'new' translations. Also, the words 'new' and 'standard' are something I want to briefly touch upon; is anything 'new' with Yahweh? The answer is found in Malachi 3:6 -- "For I am Yahweh, I change not; therefore ye sons of Jacob are not consumed." With God, nothing is new and He never changes, thankfully. What is this 'standard' that was supposedly set by the NAS? Isaiah 49:22 teaches us "Thus saith the Lord Yahweh, Behold, I will lift up mine hand to the Gentiles, and set up my standard to the people." That being said, the NAS only set a "new American standard" and not the commanded standards of Almighty Yahweh. Jesus is that standard set forth, a little food for thought before continuing on. As promised, I'd thought I'd take a look into a few passages that Satan has manipulated when dealing with the deity of Jesus. Turn over to Ephesians 3:14 and read the following verse -- "For this cause I bow my knees unto the Father of our Lord Jesus Christ." The is a very powerful statement but it's rendered completely worthless by the NASB that puts it as "For this reason I bow my knees before the Father." As you can see they totally deleted 'Lord Jesus Christ' from this passage, who but an antichrist would do such a thing? Skip down a few to verse 9 of this same chapter and we read "And to make all men see what is the fellowship of the mystery, which from the beginning of the world hath been hid in God, who created all things by Jesus Christ." Now in the NASB; "And to bring to light what is the administration of the mystery which for ages has been hidden in God who created all things." Who created all things? Right, Colossians 1:16 teaches us that Jesus created all things and the removal of his name in the NASB is an outright attack on the Godhead itself. In Galatians 4:7 the King James Version reads "Wherefore thou art no more a servant, but a son; and if a son, then an heir of God through Christ." The NASB renders this same scripture as "Therefore you are no longer a slave, but a son; and if a son, then an heir through God." Notice how the 'through Christ' is deleted? If this so-called Bible can't even point the way than where will it take you? Down the wrong path. Speaking of which direction the NASB actually points, turn with me over to Isaiah 14:12 and read the Authorized KJV text; "How art thou fallen from heaven, O Lucifer, son of the morning!" Lucifer here is a definite name -- hêylêl (pronounced hay-lale') which we covered in brief last Wednesday. The New American Standard Version? It puts the same verse as "How you have fallen from heaven, O star of the morning, son of the dawn!" Who is the morning star? In Revelation, chapter 22 and verse 16 Jesus says "I am the root and the offspring of David, the bright and morning star." 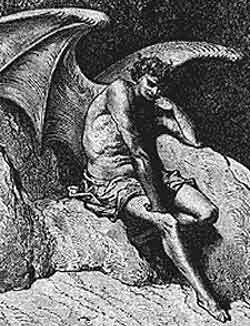 Wouldn't Satan love to be Yahweh? The Bible already teaches us that 'the son of perdition' will "exalteth himself above all that is called God, or that is worshipped; so that he as God sitteth in the temple of God, shewing himself that he is God (2 Thessalonians 2:3)." Still, the NASB gets much worse and more blatant with its attacks. 1st John 5:7-8 is probably the most important Trinitarian passage in the Bible, for it states explicitly that we have one God in three persons. These verses in the Authorized Bible say "For there are three that bear record in heaven, the Father, the Word, and the Holy Ghost: and these three are one. And there are three that bear witness in earth, the Spirit, and the water, and the blood: and these three agree in one." The NASB renders it this way -- "For there are three that testify: the Spirit and the water and the blood; and the three are in agreement." They took it from 'Father, Word and Holy Ghost' to 'Spirit, water and blood' as equal? Why would any so-called pastor read and quote from this faulty book? In Matthew 9:13 we read from the KJV; "But go ye and learn what that meaneth, I will have mercy, and not sacrifice: for I am not come to call the righteous, but sinners to repentance." The NASB drops the word "repentance" altogether and says "But go and learn what this means: 'I DESIRE COMPASSION, AND NOT SACRIFICE,' for I did not come to call the righteous, but sinners." Did Jesus come to call sinners or to call sinners to repent? There are so many attacks in the New American Standard that time won't allow me to expand on them all. I'd like to give you a few more, though. "In whom we have redemption through his blood, the forgiveness of sins" is found in Colossians 1:14 and the NASB puts it like so; "in whom we have redemption, the forgiveness of sins." Jesus' blood is plainly removed. In 2 Corinthians 2:17 it says "For we are not as many, which corrupt the word of God" and it's changed to "For we are not like many, peddling the word of God." 'Corrupt' and 'peddle' are two entirely different words. I'm out of time again so I'll wind it down rather quickly. My intention with this sermon was mostly mentioned at the beginning of tonight's subject. I'm not promoting 'the King James Only belief' although you'll also never hear me quote the outright false NAS for more reasons than are mentioned in tonight's study. It's my sincere hope that you're able to see these deletions and judge for yourself which translation or transliteration is most honoring of our King Jesus. Speaking of which, I never got to expound on the history of 'the pure Greek' text and give you some background on Erasmus like I had intended to do this evening. I wanted to trace the NASB back to the 1901 American Standard Version through the 1881 English Revised Version all the way back to the corrupted texts themselves to prove that these mentioned deletions are in the actual manuscripts. Perhaps another study is in order covering even more of the New American Standard attacks on Jesus if the need should arise in the future. It's my prayer that if you use one of these modern-day Bibles that your head doesn't become locked on its subtleties and you suddenly become a Christian soldier with a very dull sword. Study to shew thyself approved, put on the whole amour of Yahweh and go to war. There's a Fisherman's Bible, a Video Bible and a Sewing Bible, but just having the word 'Bible' in the title doesn't make it the inspired Word of God and it's my sincere hope that this sermon is able to show you that. Most importantly is I hope that Jesus will get the glory for tonight's work and uses this topic to touch those who are seeking truth. I pray that His soldiers will continue to fight and question anything that whitewashes His rightful position in the Godhead and that He uses this sermon to establish His perfect Will on earth. Our internet readers are always welcome to contact Covenant People's Ministry by either e-mail or stop by our forums to discuss even more Biblical issues. May Yahweh the God of Israel bless us all.